Cheval at Bethesda’s rooftop. Darren Higgens, Photo courtesy Cheval. The Bethesda area has been transformed in recent years by the arrival of fancy high-rise living in both apartment and condominium buildings. To attract renters and buyers, developers are outdoing themselves in providing amenities to make life easier and more interesting. The high-rises come with concierges, who handle many of the bothers and errands of daily life, including receiving packages and grocery hauling. They even help with your tech needs. Builders have added luxury communal space, giving residents the ability to entertain within the building, but outside their living quarters. Fireplace seating, large-screen TV viewing areas, private dining rooms, gyms, rooftop kitchens, coffee bars and fully equipped business centers have become common. The white-glove service is aimed at a “turn the key and leave” lifestyle. Chores like mail collection, plant watering, and cat and fish feeding are handled. The staff will tend to many household details that family members, neighbors and friends once were asked to do. Here’s what’s offered in some of the newest luxury apartments and condominiums in the Bethesda area. Would having your own butler make your personal wish list? Wish granted at the Flats 8300apartment complex in Bethesda, which has hired the New York-based “Hello Alfred” service to provide a free weekly light cleaning of your apartment, including making your bed and taking out the trash. You’re also given a phone app menu of options for a fee, such as picking up prescriptions or cleaning your refrigerator. Nearly every tiresome chore (oven cleaning, car washing) can be handled for a fee by your personal helpmate. At The Palisades of Bethesda apartments, free monthly maid service is provided for residents of the 51 penthouse units. There are no barriers to fitness for residents at Quarry Springs, the ultra-luxury condominiums just outside the Beltway on River Road in Bethesda. Quarry Springs has the largest outdoor pool of the area’s newer luxury condominium and apartment complexes; an expansive 1,000-square-foot fitness center with a multitude of machines and space to meet with a trainer; a yoga studio; and separate men’s and women’s steam rooms and saunas. At the Flats 8300 apartment complex, there are four free exercise classes a week (often Zumba and Tabata) and trainers are on call. There’s also a separate yoga studio at the fitness complex at Cheval Bethesda, a new luxury condo building. No more pet carriers for your Fido or Meowser. At the Flats 8300 apartment complex, pet groomers and vets will come to you, for a fee. Moreover, it’s just an elevator ride away to have your animal treated at a pet spa that includes two dog washing stations (for small and large breeds). The menu includes blueberry facials for dogs, milk conditioners for cats, and nail buffing and teeth brushing for all. You can show off their beauty at monthly “yappy hours,” with treats for the pets and wine for their owners. Basics like dog walking and feeding also are handled by a pet care company. The Element 28 apartment building in Bethesda also offers pet grooming, walking, training and vet services through a pet care contractor. And there are dog washing stations at 7700 Norfolk, The Brody (with a dog run), Gallery Bethesda and Gallery Bethesda II(rooftop dog run), all apartment buildings in Bethesda. The condos at 930 Rose also have an ample dog park. Green roofs, lush interior courtyards and landscaped rooftops have sprouted at many Bethesda-area high-rises. But at the 930 Rose condominiums, residents can see their future zucchini salad growing in a 17,000-square-foot rooftop garden. Condo owners get a discounted price on the produce through its farm membership program and never have to pull a weed. Residents also get a break on prices at the restaurant and bar in the Canopy by Hilton hotel, which is in the same building as 930 Rose. Making travel arrangements and organizing parties require attention to detail that you might wish to off-load on others. At 930 Rose condominiums, concierge Greg Timpone uses his training from the St. Regis, Four Seasons and InterContinental hotels to book travel, arrange baby-sitting and suggest restaurants. He also plans anniversary parties and birthday celebrations. Like most concierges, he’ll also schedule and handle any service calls to your home, lifting the burden of having to wait for the cable guy. 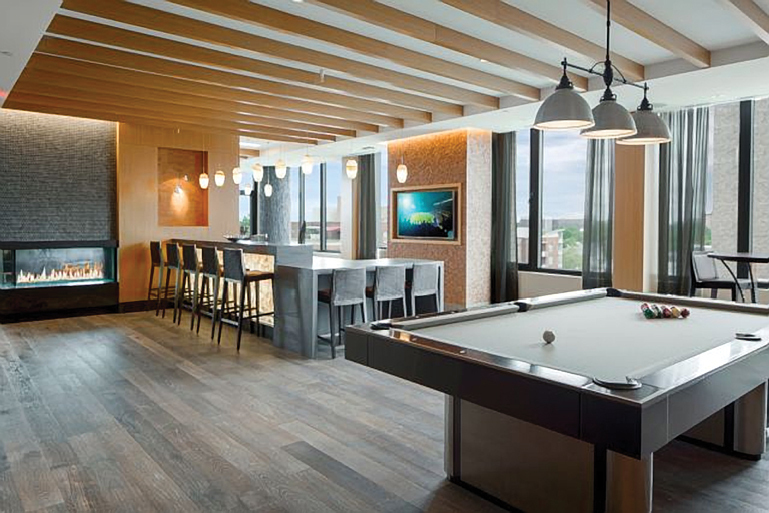 Residents of The Brody apartments are encouraged to entertain outside with an outdoor fireplace, wraparound terrace, TV screening lounge and rooftop kitchen. At the Element 28apartment building, there are no worries about a downpour affecting your party in its indoor/outdoor rooftop lounge (the glass walls slide shut). 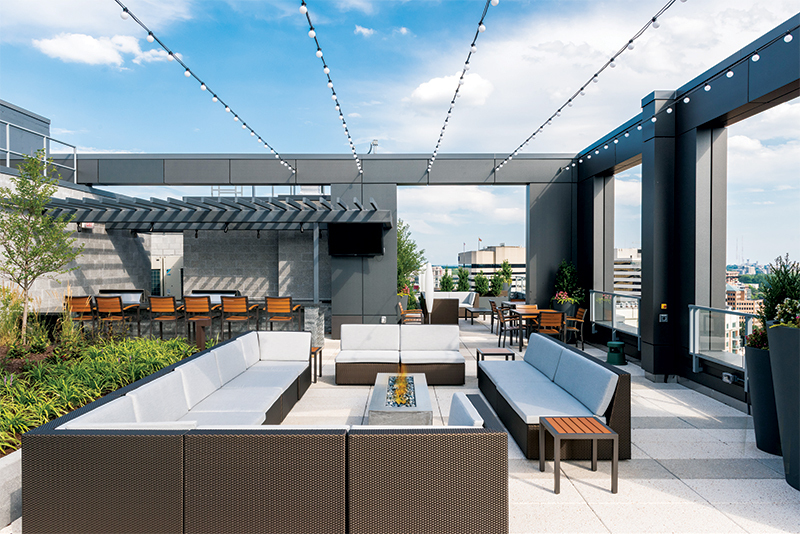 The rooftop terraces at Hampden Row, The Lauren and Stonehall Bethesda, all condominium buildings in Bethesda, have large dining areas with high-end couches, all-weather furniture and sophisticated landscaping for sunset parties. 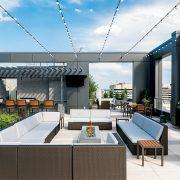 Residents of the Gallery Bethesda II apartments bake their own creations in the rooftop kitchen’s brick pizza ovens, which are flanked by outdoor grills. For water lovers, nothing beats a convenient pool. Serious lap swimmers can do their workouts in an ultramodern Olympic-length pool atop the 17-floor 7770 Norfolk apartment building in Bethesda. The poolside view is expansive—to the Mormon temple in Kensington and beyond. 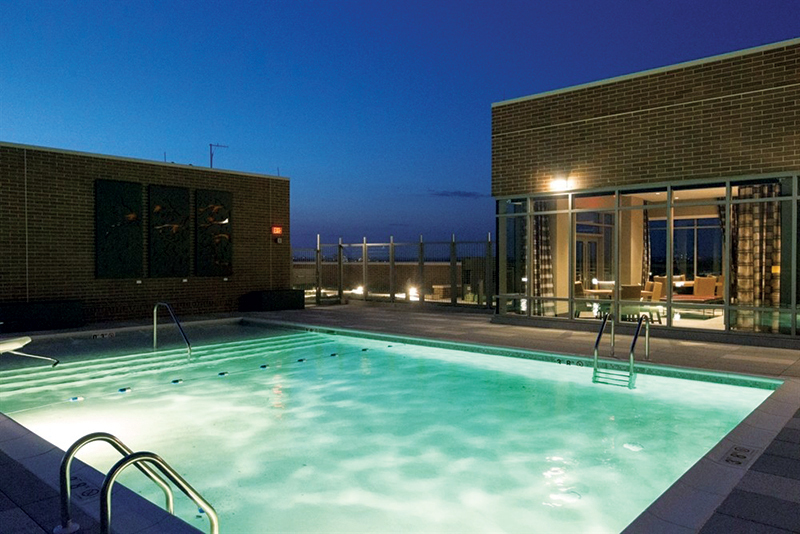 At the Flats 8300 apartment complex, swimmers and waders get their own space in two large rooftop pools atop the ninth floor, with impressive views of downtown Bethesda. Lifeguards are on duty during business hours. The Gallery Bethesda and Gallery Bethesda II apartment buildings both have rooftop pools with terrific views. All the rooftop pools are open air and are surrounded by lounge areas and umbrellas that can be used for relaxing year-round. For the residents of The Palisades of Bethesda’s 51 penthouse apartments, making breakfast is one more chore that’s vanished. Free breakfast is served Monday through Friday in the 12th-floor penthouse lounge, with fresh fruit, oatmeal, sweet rolls, cereals, juices, hard-boiled eggs and premium coffee. Cars and bicycles get special attention with charging for electric engines, car washing, and bike repair and storage available at nearly all high-rises. At The Lauren condos, residents get 24-hour valet parking. Cyclists at the Flats 8300 apartments can choose between two bicycle repair rooms, each with storage space for 60 bicycles and permanent air pumps, loaner tools and workstations. You’ll also find bike repair stations at The Brody, Element 28, Gallery Bethesda and Gallery Bethesda II. In-house experiences for community building and neighborly fun are a central part of the offerings at the Flats 8300 apartment complex. Professional comedians are hired for regular comedy nights, along with guest lecturers and musicians. The ground-floor lobby becomes a small auditorium filled with rows of chairs for the special events, which are held about every other month. 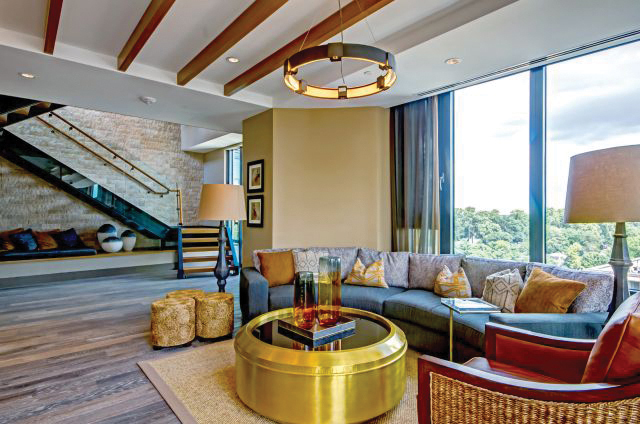 Residents and the public are invited to fine art shows in the expansive lobby of the Quarry Springs condominiums. Wine is taken seriously, with many buildings offering wine and cheese gatherings. At the Element 28 apartment building, a concierge places your wine arrivals into a temperature-controlled cooler in the lobby. At The Lauren condominiums, residents can store their own bottles in a wall of wooden wine lockers that line a special lounge. You can uncork your wine with friends in the lounge’s formal dining space. There’s also a nearby fireplace and cozy couches for a casual place to raise a glass. Concierge daily, 7 a.m.-11 p.m. The clubroom at Flats 8300. Photo courtesy of Flats 8300. Gallery Bethesda’s rooftop pool. Courtesy Donohoe. Cheval Bethesda’s clubroom. Photo by Renee Alexander, courtesy Cheval. Concierge daily, 7 a.m.-7 p.m.